afternoon or in the evening….your gallon is not exactly a gallon. atmosphere, so it minimizes the evaporation. 1. If the gauge indicator moves into the red zone, immediately turn-off the engine to prevent engine failure. If you are in the middle of traffic, turn on your flashers to indicate that your car is in trouble. Do not wait to try to find an opportunity to pullover. Better to receive a few horn blasts or yelling, than to ruin your engine! 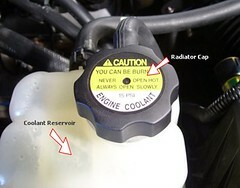 Make sure your car completely down before even touching the radiator cap and adding coolant/water. 2. Prevention is the word; however be careful of where you have any work done. There are many fast service places offering a radiator flush, or exchange. However, a radiator flush can result in disabling your thermostat, especially if the coolant is very dirty. Make sure that the service is licensed to replace the thermostat. 3. Go to summer weight oil as specified by the manufacturer of your vehicle. Viscosity of the oil will affect the running of the motor and you do not want to keep the thicker winter weight in your car unless the manufacturer states a particular weight can be used for both winter and summer. 4. Make sure that the radiator fan is working. The fan can work intermittently giving you probems that appear and disappear. Have an electronic diagnostic run if you notice that your car periodically starts to get hotter. Several things with the fan can be causing the trouble, a short, a faullty fuse or heat sensor, and ultimately the fan motor. 5. Check that your tires have the proper air weight. 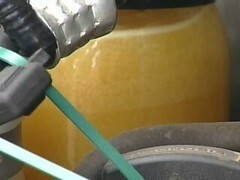 Under-inflated tires can cause the engine to work harder and will also use more gas. Additionally, this is true of any additional weight, so don’t use your vehicle as a storage area. This year’s Living Green Expo is going on this weekend (May 3 to 4) at the Minnesota State Fairgrounds in St. Paul. Thousands of fair-goers of all ages walked through the exhibits and demonstrations. This year’s expo was mainly geared towards home-owners with several booths featuring energy-saving ways to power your home such as geothermal, wind, solar, and biofuel, as well as business that use eco-friendly roofing, flooring, and siding products. 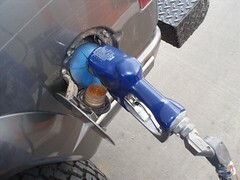 Another major type of exhibit was fuel-saving vehicles, hybrid cars and SUVs (e.g. clean-ride.com, hour car, Minnesota Electric Auto Association) and tables supporting alternative travel arrangements. For example, the Minnesota Transit Authority (MTA) displayed a hybrid bus and passed out light -up buttons for those who pledged to car pool or take the bus and train most days of the week. Educational tables such as the University of Minnesota, the Minnesota Department of Health, and the Minnesota Environmental Partnership were also available. Food, natural products, and re-used or recyclable venues were also present, many of which are listed below. Mission: Provide consumers with fair trade, fair made, eco-friendly clothing. Description: Birch clothing is made from natural fibers such as organic cotton, help, silk, wool, tencel and soy. Description: Vintage house and furniture hardware. Store Hours: Mon, Tues, Th, Fri 12:00 to 6pm; Wed 12:00 to 4pm and Sat 11 to 4pm. Description: Bamboo towels, sheets and more! Description: Beeswax candles, hemp soap and other all-natural bath and body products, guitars from old cigar boxes, bracelets from bicycle chains, and purses from old license plates. Description: Wedge Worldwide empowers you to make lifestyle choices that support your well-being, your health and the health of the planet. Products are eco-friendly, fair trade, organic, recycled and local. Markdown Mom’s husband has a friend at work who is one of the best bargain hunters. Unparallel in so many ways, he has no qualms of making a great deal even when the "deal" is not the one offered. In recent years, he has forsaken Black Friday since any deal is not a given despite arriving early and camping outside the retailers. Oftentimes, he has found very limited stock that will not meet the demand of all the early bird shoppers. Therefore, after waiting in the Minnesota cold only to be part of the stampede that ultimately ends up with only a very few of these diehard shoppers getting their hands on the item of their desires and the multitudes left being told "sorry, we are out of stock." This year, he looked at ads in the surrounding towns and found a "deal" at a local car dealership. Advertising "It only happens once a year," this local dealership offered for sale cars starting at $100 with a "first come-first served" provision. Now, this ardent bargain hunter did not expect 2007 car for this price, but deemed it worthwhile to go there to look at these "$100 cars," with the possibility of finding a car and driving it home either as a fixer upper or for spare parts. With that in mind, he went to the dealership and waited in the cold for 2½ hours. Finally the moment arrived, and he was ushered onto the lot to view the $100 cars except it wasn’t cars as advertised in the paper, but car–singular. Not only was it only 1 car, but the condition of the car was in no way road worthy. Incensed at the deception, the savvy bargain hunter was well aware of the bait and switch, say nothing about the false advertising state laws. With this obvious ruse, he informed them that there would be repercussions for his spending 2½ hours in the cold based upon a lie! It was his intention to write the local media and the authorities of this flagrant violation. Now everyone knows car dealerships rely on their reputation and word-of-mouth recommendations by happy customers. This "fast one" they had tried to pull would generate publicity, but not the right kind of publicity for their business. They then proceeded to find him another car that was more acceptable. The first car shown was not much better than the $100 car, and was flatly refused. 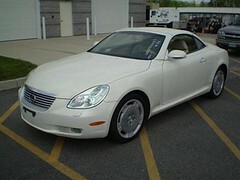 However, the salesperson showed him a ’99 Oldmosbile, 100,000+ miles, large engine and economical 6-cylinder. The bargain hunter had overheard another salesperson to two other gentlemen on the lot of $2000 on the same car, a price disparity of $1900 from the the $100 cars advertised. After test driving the vehicle, the bargain hunter, was offered the same vehicle for $1500, but without any hesistation turned that price down reiterating the false advertising of vehicles that could not be driven on the highway! He then offered the salesperson $500 for the vehicle. The salesperson sputtered and said that he would have to speak with the "manager." When he returned, the salesperson counter offered $750. The bargain hunter remain firm at $500 suggesting that if he walked off the lot without a deal, others would know about the questionable advertising done by this dealership. The salesperson conferred again, and came back accepting the $500 offer of the bargain hunter. As the papers transferring ownership were being drawn-up, the bargain hunter checked the paper for a price comparison and found that similar vehicles were being sold for around $6000. While Markdown Mom is writing this, this super bargain hunter is heading back to get the title, pay the sales tax, registration, and license plates plus $500 and picking-up his Black Friday Car! This is a true story, and one that points out the necessity of every bargain hunter to be savvy not only about a particular item, but other issues that come into play such as the reputation of a business and laws governing sales. Plus this bargain hunter did the one thing that everyone should practice, make an offer, stick to it, and if need be, be prepared to walk–and in this case, talk.